Cowley College’s criminal justice students now have an additional reason to strive to achieve academic success. 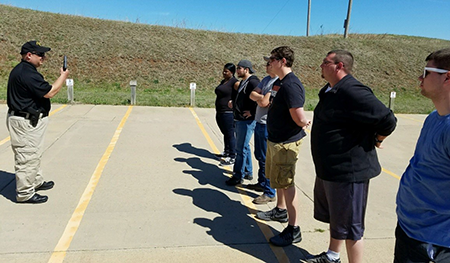 The criminal justice program has teamed with area range instructors to offer a new incentive program to encourage students to maintain focus on their course work. In a cooperative agreement, several area range instructors have volunteered their time to offer professional range training and time at the law enforcement range for students that maintain a specified grade level in their course work. Students that meet the set goal will now have regular professionally supervised range training. For the students in the program this is a great incentive. They now have access to instructors and can build their skills. The program kicked off this month with introductory range training from Officer Eric Jarvis of the Winfield Police Department. During the initial session students were introduced to range fundamentals, including terminology, grip, stance, and trigger reset. Students also engaged in fun competitive shoots including a bowling pin challenge and dart competition. Pictured with instructor Eric Jarvis are, from left, Aniya McGowan, Aaron Willoughby, Bo Rose, Cordel Gallagher, Jeff Robertson, and Jeff Pentland.